The extent and degree to which green, low-carbon economies are emerging varies widely internationally, as well as across the 50 U.S. states. Earlier this month, for example, Kansas’s legislators voted overwhelmingly to repeal the state’s renewable portfolio standard (RPS). Established in 2009, Kansas’s RPS paved the way for wind power to supply nearly 3 gigawatts (GW) of emissions-free electricity, enough to meet nearly 22 percent of the state’s power needs, the third highest percentage among U.S. states. It also helped attract $8 billion in wind energy investment, which led to the creation of as many as 12,000 green jobs and more than $10 million a year in payments to Kansas landowners. While Kansas and other U.S. states are regressing, several U.S. states stand out when it comes to forging a path to a healthier, more dynamic and environmentally friendly fossil fuel-free energy future. Leading the way, California is demonstrating that establishing an institutional framework that promotes clean, distributed and renewable energy sources can lead to sustainable economic growth and help resolve critical social and environmental challenges at the same time. 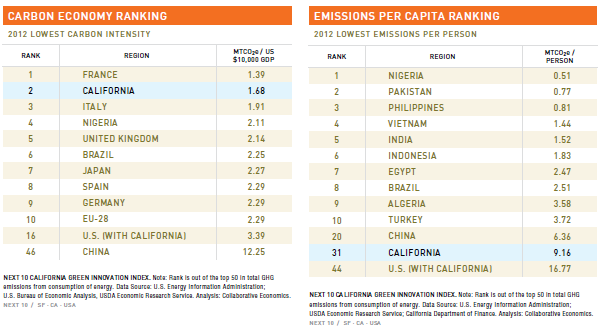 According to non-partisan state public interest group Next10’s 2015 California Green Innovation Index report, California is among world’s least carbon-intensive economies. 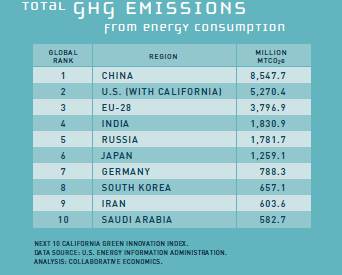 Highlighting the state’s leadership internationally in advance of a key UN climate change conference to take place in Paris this December, California ranks in the top ten worldwide in terms of renewable energy generation, clean tech investment and energy productivity. In advance of the UN climate conference this December Next10’s 2015 Green Innovation Index is the first “to analyze and rank California’s economic and energy performance in comparison to the world’s 50 largest greenhouse gas emitting nations,” the non-profit organization points out in a news release. 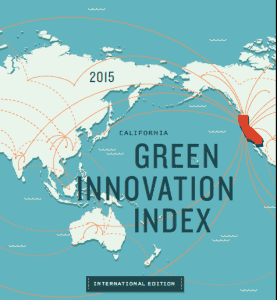 The first international edition of Next10’s report shows that both California and the U.S. “lead the world on several critical indicators” of “green” innovation. “With one of the world’s largest economies, California is growing its GDP while shrinking its carbon footprint. 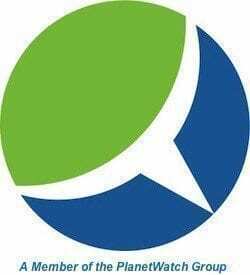 It is a prime example of the decoupling of economic growth and energy use that is beginning to happen among the world’s most productive nations,” F. Noel Perry, businessman and founder of the nonpartisan nonprofit group Next 10, was quoted as saying. “This year’s California Green Innovation Index tracks a clear shift to clean energy around the world. Although fossil fuels still represent a significant portion of our overall energy use, many analysts believe we have reached an important tipping point—globally, we are now adding more capacity for renewable power annually than fossil fuels,” added Doug Henton, chairman and CEO of Collaborative Economics, which developed The California Green Innovation Index, International Edition for Next 10. Instituting what’s considered the most comprehensive, integrated and enlightened energy policy frameworks in the nation, California is proving that it is indeed possible, and beneficial, to decouple economic growth and development from carbon emissions, pollution and energy intensity. Other state government leaders apparently are intent on protecting big utility and fossil fuel interests and the status quo, however. Having signed Ohio’s RPS into law in 2008, Governor Kasich approved its repeal in June last year. And in legislative action that was deemed largely symbolic, West Virginia’s new Republican-led government passed its RPS repeal this past February. A threat to California’s green energy drive has emerged as well. Based on recommendations from its big three investor-owned utilities (IOUs), the state’s Public Utilities Commission (PUC) is moving forward and is expected to vote on a plan that would restructure the state’s electricity rates in a way that opponents say would reverse incentives that have led to increased energy efficiency, solar rooftop installations and benefitted consumers across the board in favor of reducing them for large consumers at the expense of smaller ones. “If approved,” Evan Gillespie writes in a Los Angeles Times op-ed , “the plan would result in a pricing system that substantially lowers bills for a handful of high energy users and pays for that discount by raising rates on the majority of California households. It also would lower incentives to conserve energy or install rooftop solar. The new rules are out of touch with California’s ambitious clean energy vision and will hurt working families. The proposal deserves fierce pushback from the public and policymakers alike.